This month’s featured catfish is the Tapah (as it is locally known in Indonesia and Malaysia and never confused with any other catfish), essentially a leaner, sleeker version of the European wels (Silurus glanis) with an equally fearsome reputation. The fish is a beautiful brassy-olive with the body marbled in black and white by day and assumes a paler grey with longitudinal bands of grey and white running along its flanks at night. However, its upturned mouth and an impressive battery of sharp teeth combine to give this catfish an unsettleing grin. One of the largest freshwater catfishes in Southeast Asia, the Tapah can reach up to 2 meters (6 feet) in length and weigh over 80 kilograms (176 lbs). Perhaps in keeping with its “leerii”-ng countenance, the Tapah has a fearsome reputation as a rapacious predator that attacks any animal small enough for it to swallow. Fish, frogs, waterfowl and even small mammals are not safe from its cavernous toothy gape. There are even reports of this aggressive fish attacking bathers. Malaysian folklore has it that the Tapah was so jealous of the Keli’s (Clarias) eight barbels to its two that it will try to eat its smaller cousin at any opportunity. In Southeast Asia, the Tapah is regularly caught for food and its flesh is of excellent taste (I had the opportunity to verify this in central Sumatra). It puts up a great fight when hooked, sometimes towing a boat with its occupants for a considerable distance. Keeping one in the aquarium is not for the faint of heart. Given the large size it can grow to [at least 60 cm (2 feet)] and its nature as an active predator means that it needs plenty of swimming room (something in the league of an 8-foot tank). Its reputation as a great jumper also means that a sturdy cover is necessary. Neither is feeding particularly easy (or cheap), given that it very much prefers live food. Introducing feeders into the tank usually results in the fish darting out of its resting place, and an almost casual sidle right up to its prey. A quick lunge too fast to be seen (usually accompanied by a loud thud as it hits the aquarium walls) and all that’s left is a shower of scales and a catfish with a very satisfied grin. In time, the Tapah will learn and strike at prey the very instance they are dropped into water (usually resulting in a slight drenching to the owner), which means that strips of raw meat can be substituted as a healthier alternative to feeder fish or frogs. To make things easier on your wallet, the Tapah is perfectly happy fed only once or twice a week. The Tapah is a loner and will attempt to eat tankmates. Given its need for swimming room, is perfectly happy with a minimum of “furniture”. One has to be careful with the water quality, though, as they are very sensitive to high ammonia / nitrate levels (the first sign of trouble is a loss of appetite immediately followed by barbel rot). 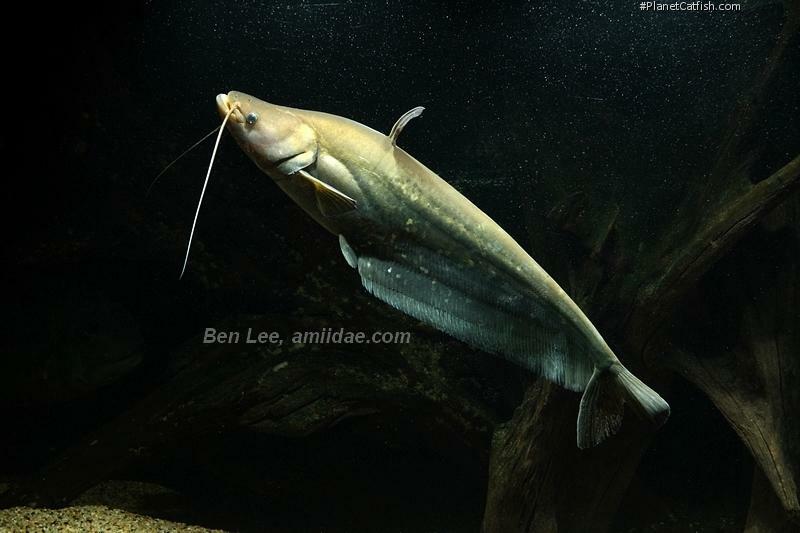 A catfish with a personality that will learn to recognize the owner (greeting at feeding time usually takes the form of a quick dart out of hiding followed by an expectant hovering near the surface of the water), the Tapah can be as endearing as Rover or Skip and promises years of enjoyment.